Come around to SITE L13 where we'll be showing our ELITE canopy, Top Up lid and new range of premium accessories. Seymour Expo is always a great day out for the entire family and 2019 will not disappoint. Keep an eye on our socials to WIN free entry tickets. 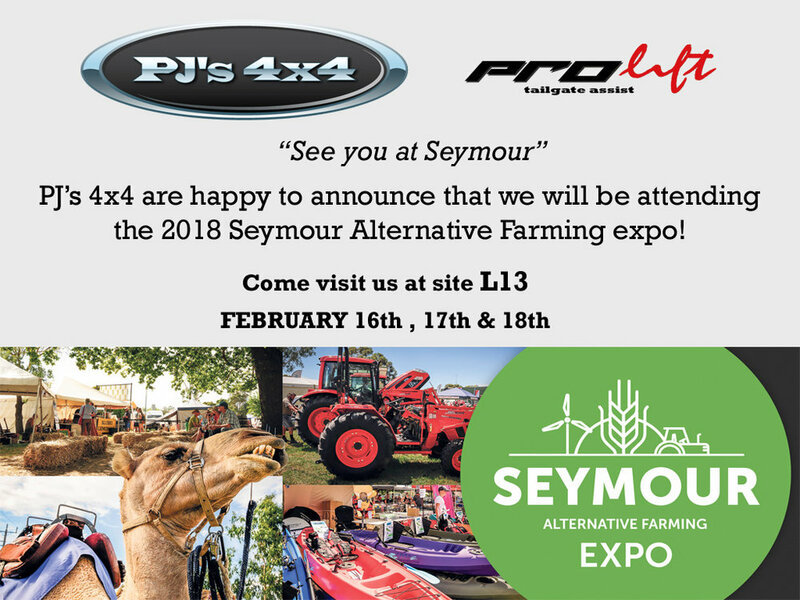 PJ's 4x4 are proud to announce that we will be attending the 2017 Seymour Alternative Farming expo. Being held February 17th, 18th and 19th with PJ's 4x4 located at site L55 and L56! Open from 8:30am – 5pm Friday and Saturday and 8:30am – 4pm Sunday, the Seymour Alternative Farming Expo specialising in the latest technology and trends in small holdings farming, animal husbandry and rural lifestyle products and services. The Alternative Farming Expo is located in the heart of Seymour at Kings park in Tallarook St, Seymour, only one hour from Melbourne in Victoria, and is easy accessible from the Hume or Goulburn Valley highways or by V/Line Train. For the first time ever, PJ's 4x4 are taking their roadshow down to Gippsland to show the friendly folks down south what they have to offer! There to display the latest ELITE canopy along with their other famous products, all at amazing show prices. Don't miss this event November 17 - 19 at the SALE racecourse. The Great Outdoor Expo’s focus is to stage excellent events which meet both industry and client needs. Our committed team understands the importance in identifying and meeting customer expectations, and so tailors solutions to ensure each exhibitor has a profitable show experience. The Great Outdoor Expo aims to create unequalled face to face business opportunities by delivering market leading exhibitions in regional Victoria. The foundation of our business is built on exceptional customer service, respect and integrity in the pursuit of mutually profitable outcomes. In our experience there is no better way to promote, develop and advertise your business than participating in a well organised and advertised exhibition. For the first time ever, PJ's 4x4 are taking their roadshow accross to Mount Gambier SA to show the locals what they have to offer! There to display the latest ELITE canopy along with their other famous products, all at amazing show prices. Don't miss this event April 20-22 at the Mt Gambier Showgrounds. For the first time ever, PJ's 4x4 are taking their roadshow down to Ballarat to show the locals what they have to offer! There to display the latest ELITE canopy along with their other famous products, all at amazing show prices. Don't miss this event March 2 - 4 at the Ballarat Showground. PJ's 4x4 set to visit ELMORE FIELD DAYS once again! 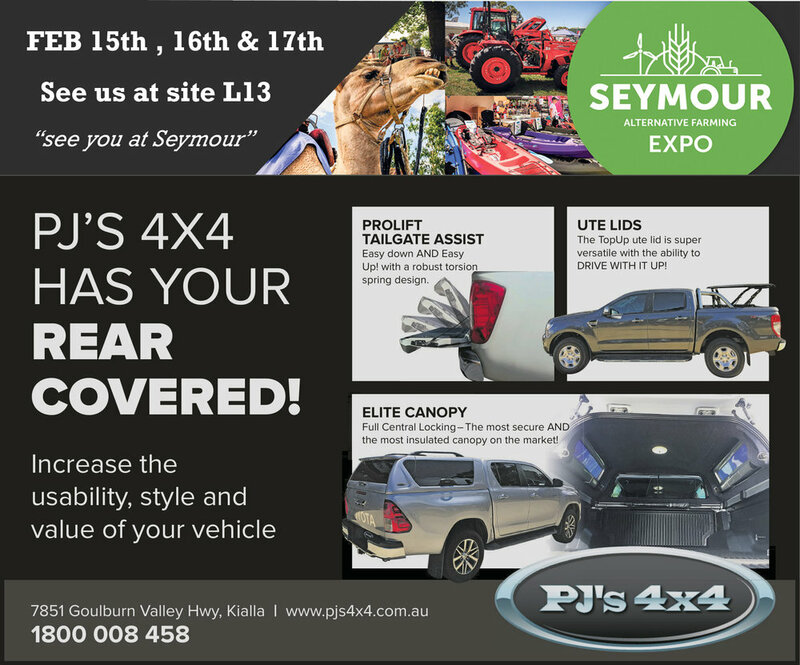 Come on down the the annual ELMORE FIELD DAYS on October 3,4 & 5 and visit PJ's 4x4 at site AP108 in the Agribusiness Pavilion for amazing deals on our entire product range. Bring the whole family to meet the team and see our latest ELITE canopy along with the famous ProLift tailgate Assist while exploring all that the field days have to offer! PJs 4x4 launch THEIR new online shop! Check out our online store now! With the ProLift tailgate assist at a all new low price and the cargo bars going out for a crazy $99 it time to cash in our cart at PJ's online shop! click the picture to the right to go the to shop now! We will be back and bigger than ever for the 2nd annual Shepparton Tradies and Farmers day - showcasing our lastest and greatest ELITE canopy to suit the Toyota Hilux and of course our ProLift tailgate assist and other premium products.! Hosted in the big shed at the Shepparton Showgrounds on February 24th between 11am and 6pm for a gold coin donation with all proceeds going to prostate cancer research. With plenty of new local exhibitors and a fun atmosphere for all the family, its a must see local event! Come in your work gear for the 2 hour Tradies sports show starting at 6pm ($50 ticket), Hosted by Master fisherman, Football tragic and former cop- REX HUNT, it's sure to be an entertaining night full of laughs and stories! For more information please call 1800 008 458 and we'll see you there! - Fully framed Lift up doors for ultimate security. - Full central locking integrated into your FOB key. - Suspended roof lining for unbeatable insulation. - Stylish design, level with the vehicles roof line. - LED interior light activated from all 3 doors. - Rear window heated demister. - 50/50 sliding bulk head window. - Strong roof rails able to support 85kg that are removable so that you can customise your roof configuration i.e rack, basket etc. - Painted in your manufacturers colour using high end DuPont paint. - Heavy duty locking mechanisms. - LED high level brake light. - Unique water drainage system.